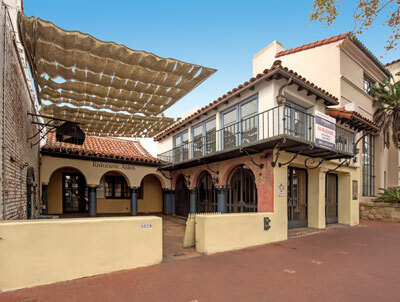 Edwards, Plunkett & Howell - a prolific architectural firm which organized the day after the catastrophic 1925 earthquake in Santa Barbara - designed this building in the Spanish Colonial Revival Style. It opened as the Copper Coffee Pot in 1927. In 1932, Edwards, Plunkett & Howell designed an addition. In 1946, a remodel compromised the architectural integrity of the building. In 1987, the exterior was restored to its original exterior. For almost sixty years, the Janssens-Orella-Birk Building was a center of social activity for Santa Barbara's literati and local celebrities. This site has been occupied since the 1850s when Augustin Janssens built an adobe here. 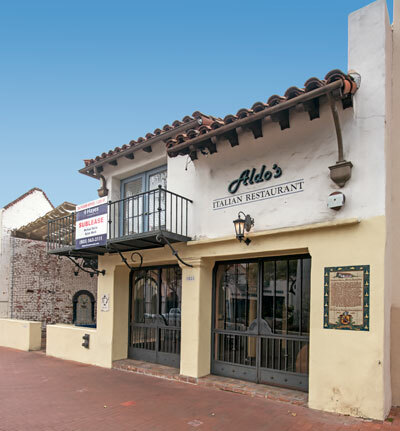 The adobe was the Orella family home until the construrion of the Copper Coffee Pot restaurant. Birk was the last owner and operator of the restaurant. Source: Adapted from the NRHP nomination submitted in 1987. An adobe house was built here in 1857 where Don Agustin Janssens, a Belgian, and his wife, Maria Antonia Pico, lived into the 1870s. Janssens, a frequent office holder in the region, had arrived in California in 1834. 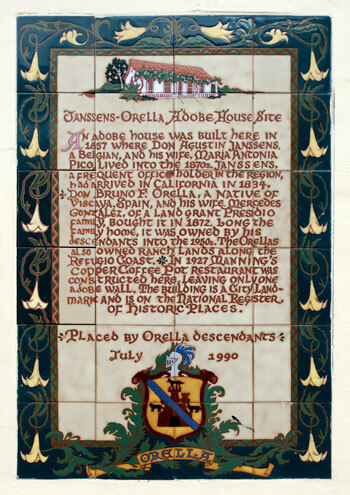 Don Bruno F. Orella, a native of Viscaya, Spain, and his wife, Mercedes Gonzalez, of a land grant Presidio family, bought it in 1872. Long the family home, it was owned by his descendents into the 1950s. The Orellas also owned ranch lands along the Refugio Coast. In 1927 Manning's Copper Coffee Pot restaurant was constructed here, leaving only one adobe wall. The building is a city landmark and is on the National Register of Historic Places. When we photographed the building in March of 2017, it was vacant.